Par Molag is an Ayleid ruin in northern Glenumbra, north of Cath Bedraud. 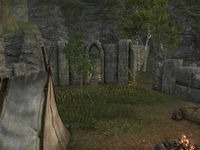 The location is home to a special crafting site, where you may craft items in the Ashen Grip set. Its name means Fire's Grip in Ayleidoon.